AdSplash features an improved tab system that turns into accordion on mobile devices making this the most responsive, mobile friendly child theme for Classipress. Recent ads (3rd tab) is presented by default to new visitors but this can be changed to a different tab ( there is an admin option built for this ). Popular and Random ads front tabs can be disabled from admin for every visitor or only for the ones that use a mobile device. 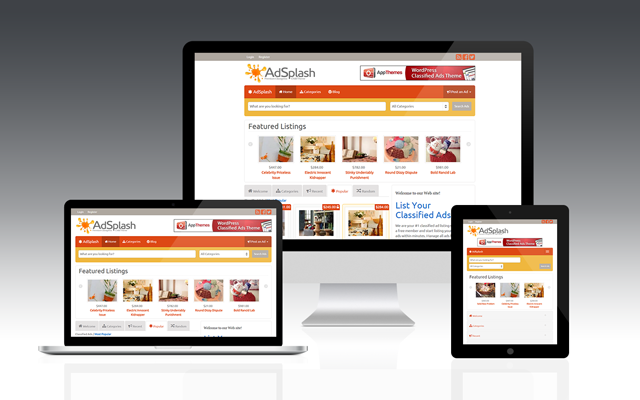 AdSplash features multiple color variations (Orange, Brown, Cherry, Grey, Green, Navy) for you to choose from. You can also choose how you want your content to be displayed (Aligned to Left or Right). the user can switch between List and Grid layout with a click of a button. new site visitors are presented with grid layout by default but this can be set to list as well ( there is an admin option built for this ). a site wide cookie is being set for the user to save the default selected layout, this way, the users will see the preferred layout design when they browse your site and even if they close the browser and come back later, the will be presented with the same design. The top search bar has a unique feature that allows users to search for ads in a specific location using radius search. The City field is powered by Google Maps API and includes the options to either determine the user’s current location using Geolocation or to autocomplete the location as the user types the first letters. If City, Zipcode with Radius Search is too much for you, there’s also an option to use any other custom field as a location. Besides default pagination that exists in Classipress, AdSplash has an optional pagination based on Infinite Scroll. Using this feature, visitors won’t have to click on page links to navigate in category pages because its enough to scroll down and new ads (pages) are loaded on the fly using ajax. This feature is optional, it can be enabled/disabled in AdSplash admin settings. Now you can include an Adsense ad (468×60 recommended) after every 3rd ad on category pages. Better yet (see bellow), these Adsense ads play well accross mobile devices. AdSplash has support for Google’s new Asynchronous code for Adsense which means Adsense ads won’t break the Mobile experience anymore. Single ad pages are extended with a set of 5 random related ads from the same category. AdSplash has an options framework integrated so you can change some of the unique features present in this child theme. Why are my thumbnail images stretched? AdSplash child theme uses custom image dimensions which means you need to regenerate your existing thumbnails for this to look fine. Where are the menu items / icons and how can I enable them? Menu icons can be enabled for the Header menu (Primary Navigation) from within the Menu Editor just like in the screenshot bellow. Note the fa-home icon name in the title attribute. Backup your existing Database and Classipress files to a safe place. You may need to set your menus again. 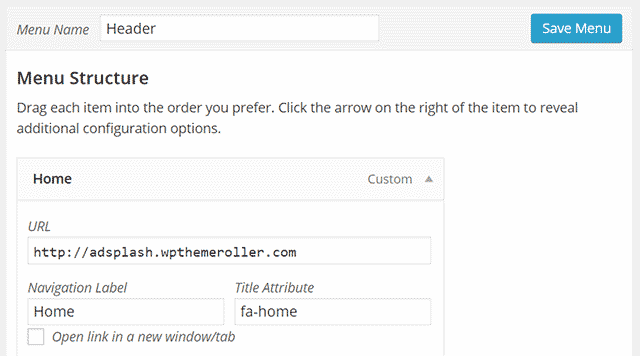 Go to WP-Admin – Appearance – Menus and activate your Header and Footer menu. If you had a previous Classipress installation with existing content, your thumbnails may look stretched, you need to regenerate your thumbnails after childtheme activation: Please install the Regenerate thumbnails plugin and run it. Note: I do not provide support for custom development of the Child Theme. I will generally answer such questions with guidance and even small code samples but do not expect me to do all your work. 1.0.1 – Fixed issue with search button style. 1.1 – Added a new options framework together with the ability to change layout (Aligned to Left or Right) and also two new colors for you to choose from. Make sure you save the new options from within AdSplash Options menu. 1.1.2 – Added Grey stylesheet and minor css tweaks. 2.0 – Added Location in top Search Bar and also in the ad meta. Added Green color. 2.1.1 Fixed small bug on older PHP versions. 2.1.2 Added backwards compatibility for Classipress 3.4+ and latest Wordpress for those who don’t want to upgrade to Classipress 3.5.1, this fixes the password field issues for them. 2.1.3 Added a new feature to detect when a user is online and show their presence on ad meta, ad poster tab and author page. Minor bug fixes that have been reported. 2.1.5 Added counter for uploaded images in the ad loop, fixed reported bugs. I fixed it, will be available in the next version. @thisov , that sounds like an issue within Classipress. Most likely you upgraded WordPress without upgrading ClassiPress as well. You need to run the latest versions of the software. This is a nice child theme ! When using the search with google geolocalization, I type a precised place in the field ‘City / Zipcode’, with a defined radius, without category precision, and no word in the text field. The result page displays all the items, without any filter on the localization. So items not in the selected city (even including the radius) are displayed as results. Is something wrong parameterized ? Have you encount this problem ? Is there a known bug about that ? To precise it, this seems to be the same problem than the one mentionned by ‘Bair’ on the previous comment page. Its hard to say without having a look. The ads should have all the necessary geo location information stored in the database. Perhaps you’re missing something? https://test.jibo.ro <- all ads are geo located within USA and appear to be working just fine. After some changes/tests it’s really hard to identify the origin. Would you have un direct contact where I could send you more information about my website ? Sometimes the result is fine after changing settings, and just after it’s KO. I dont know if it’s due to a cache (maybe ? but even after deleting browser cache, problem is still here ). So… nothing that changes core of the searchbar system. That point is crucial for my business so I really need to fix it. Hi, any help about my previous post please ? @entreparisiens, I sent you an email 4 days ago. Can you please check your mail and get back to me in there? Your theme is really nice! I’m interested on the “My Account Menu” and “Grid View”. 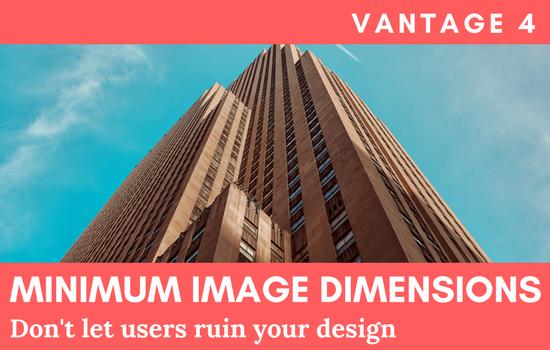 Do you plan to deliver a plugin to both features to be installed with ClassiPress and Vantage? I would like to see demo of this theme with post section. You mean you want to see the blog section? I don’t have any demo content in there. I’ll add some when I get the chance. I’m very interested in your classified ads solution, but I need some clarifications about the differences between ClassiPost, AdSplash, and Jibo. 1) Are the 3 products different only in the graphic aspect or do they have different (frontend / backend) features? Eventually do you have a summary table of differences? 2) Grid view + Infinite scroll I see on Jibo’s demo are similarly applicable to the other two products? 3) The fact that Jibo is absent the searches into city/zip code depends on the options configuration or is this feature not foreseen? I apologize for the many questions … My need is to migrate my ad site (built in java/jsp but with old and non-responsive layout) that has 138,000 ads. For this reason, I needed these clarifications to understand which of the 3 products fit my needs. You can also reply on my private email. Claudio, the themes are different from each other, ClassiPost being the most advanced and most responsive across devices. You can see the admin options on the demo site for each of these themes. 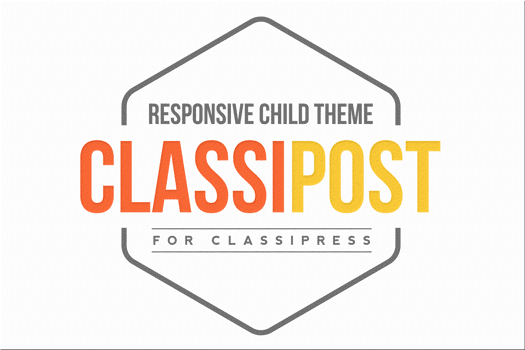 Please note that these are just child themes (skins) for ClassiPress which runs on WordPress. Your biggest challenge is to migrate your content over to WordPress / ClassiPress first and only then worry about the looks. The page or ad listing you are trying to reach no longer exists or has expired. Hello. The demo site doesn’t allow posting any ads. You can register on https://test.jibo.ro/ and test the front-end ad submission. I am interested in learning how ClassiPost is more advanced than Adsplash. Seems to me, AdSplash has many more capabilities when it comes to *sorting and filtering* ad results. I recently purchased ClassiPost, and now am feeling a bit of buyer’s remorse. Should I have chosen AdSplash instead??? 1-Does it support right 2 left languages? 2- How many days are your update support? I want to know about the future of this them when new updates comes for wordpress and classipress? 4-contact information of expired ads will hidden? Hi John, RTL needs some development but can’t help you much since I’m not native with those languages. Support is valid for 12 months, after that.. you need to purchase a new support subscription. Doesn’t have the features you’re mentioning at 3 and 4. I purchased AdSplash because I would like to use the grid view on my website. I going to try to upgrade the ClassiPress 3.0.5.1 on a multisite to ClassiPress 3.6.1. Before I do that on the live site I have created a clone test site with the WordPress 4.9.8 and ClassiPress 3.6.1 with AdSplash to see if everything will run correctly. I have 90 sites on the multisite but I can only get the network admin site working on AdSplash. the other sites do not seem to be able to get any of the themes. Those sites show up in text form. How can I set the theme for all the sites. Hi! I bought this theme for some time, it’s version 2.1.7. I was using it in another project and now I have the error: ERROR: Nonce field is invalid. How to fix without having to buy a new license? What about the compatibility with Classipress 4.1 and WordPress 5.01 ? Can you confirm there’s no issue ? @Laurent, none of the current 3rd party child themes work with ClassiPress 4.x as this is a major rewrite of the front-end. Thank you Ovidiu for your reply. Have you planed to update AdSplash ? If yes, would you have any release date ? 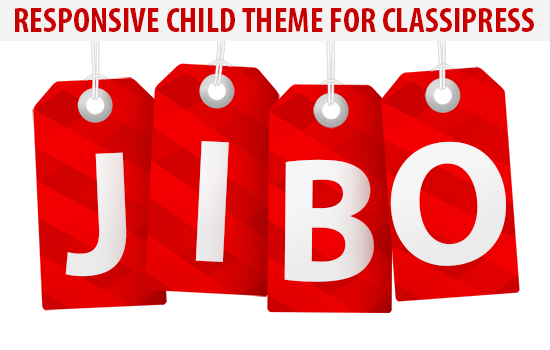 The most responsive and user-friendly child theme for ClassiPress. 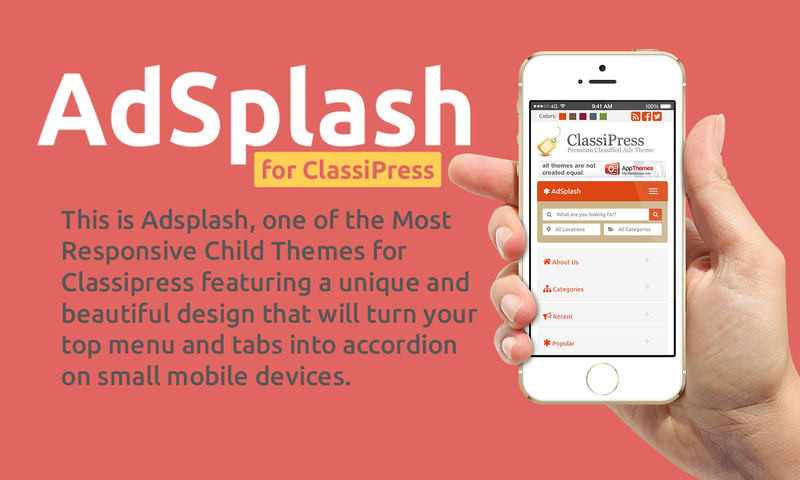 A beautiful, well-crafted, responsive child theme for ClassiPress.